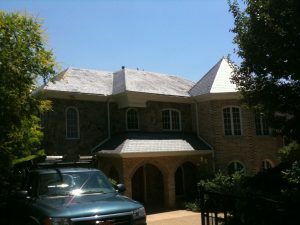 We have been repairing the roof on this house for years. The house was roofed with a tile that was designed to look like slate; it was made up of slate dust and cement formed into a uniform slate shape. The product failed miserably and the company that produced it was sued out of existence. 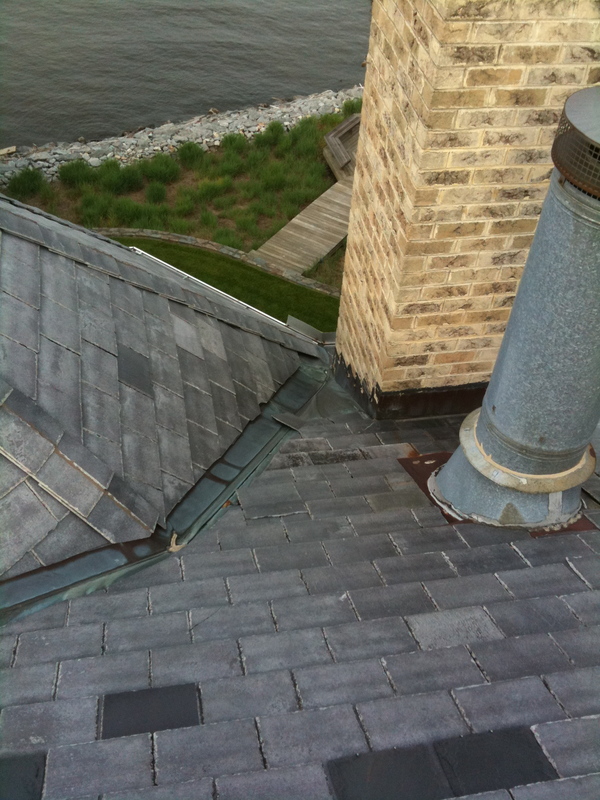 The darker spots you see are where I made repairs to the roof; since the original product is no longer available I had to use real slates for repairs. There is a flat roof on top of this house, the old roof was black EPDM rubber. Although it never leaked, it’s matte black surface got incredibly hot. There were also two fans on thermostat controls that would try to keep the attic interior cool. 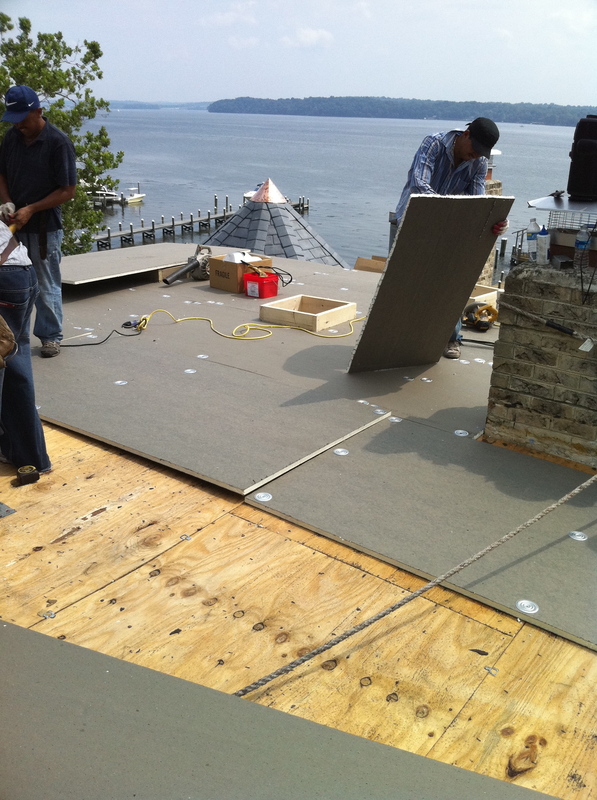 Once the old roof was removed we checked that the plywood roof deck was sound, this house had no leaks and it’s roof deck was in great shape. We installed new waterproof underlayment to provide temporary coverage and to give us a new clean surface to lay out our slates. The large copper flashing around the flue pipe was fabricated in the shop, since the material we are installing will last for 50+ years it becomes critical to have all flashing components last just as long. 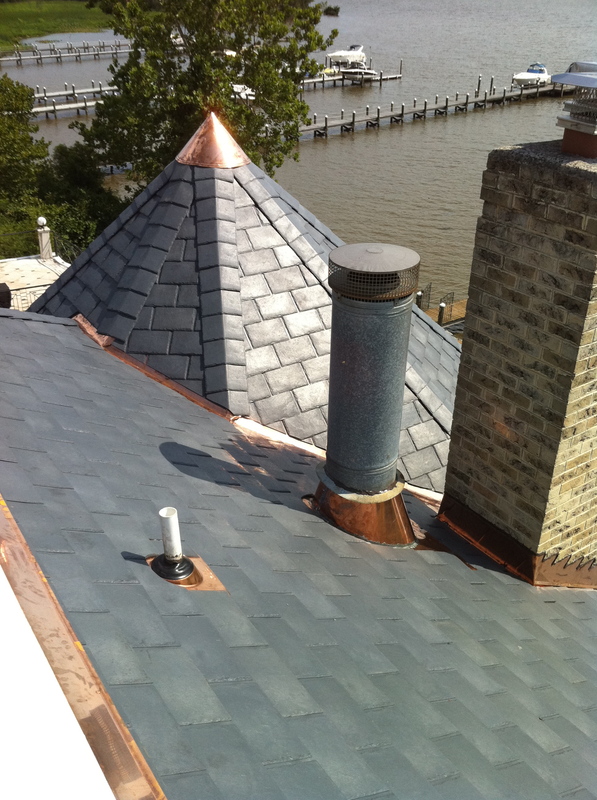 Copper flashings will last for at least 80 years. The Owner chose Eco-Star Majestic Slate in Federal Gray; I think is was a perfect choice and it complements the stone and brick you will see later in post. I tell clients “I never want to see you again”; and I mean it in the best possible way. I’ll never leave any component on a roof that might cause a problem in the future, we replace every bit of flashing, every pipe collar and even decorative pieces. I fabricated the turret caps in the shop from 16oz copper. 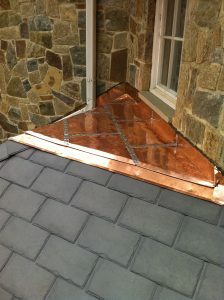 There are two small flat seam copper roofs on the house, they are basically sheets of copper that are folded at the seams and soldered with tin/lead along the seams. 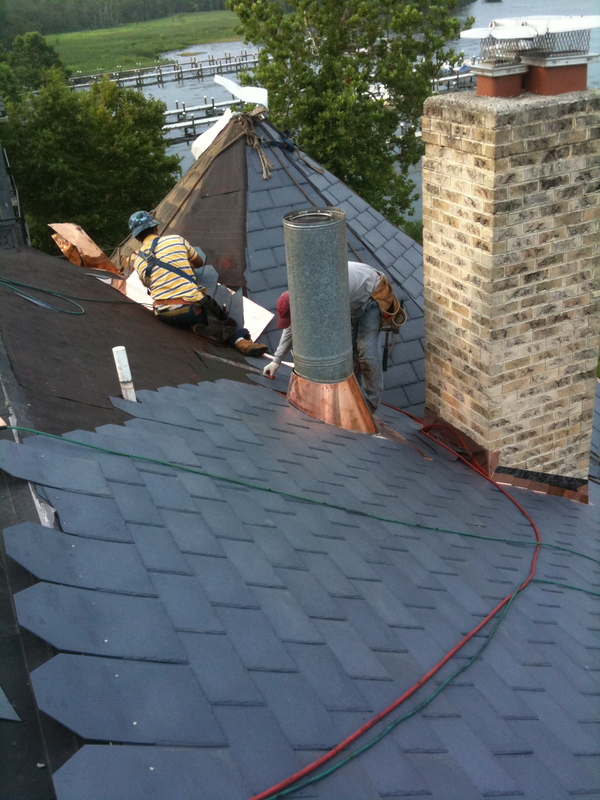 After a month or two the roofs will turn a bronze color, within 12-20 years they’ll turn to a perfect green patina. Here you see the second flat seam copper roof and a really good close up of the slate. 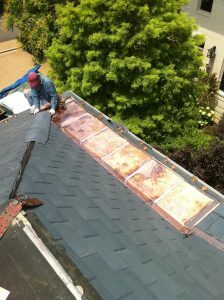 Once we removed the old black rubber roof we installed new polyisocyanurate insulation board, this is a dense foam board that provides a high r-value and a clean smooth surface to lay out our new roofing membrane. 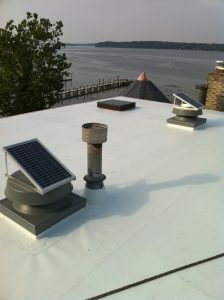 The small silver plates are used with epoxy coated screws to anchor the insulation to the roof deck. Since the house is taller than any tree around it we took full advantage of the sun. The new roof membrane we installed is white TPO; a thermoplastic that uses no adhesives or sealants (low voc) in its installation. The seams of the roofing and the associated flashings are welded with a hot air welder; once finished they require no further maintenance or caulk over the life of the roof. The previous black rubber roof easily reached 160 degrees in full sun, our new bright white TPO roof is only a few degrees above ambient air temperature because of its naturally reflective surface. 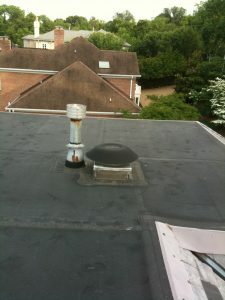 The old roof had two electric attic fans, one was noisy and the other had stopped working altogether. I replaced them with these solar powered units; the panels face Southwest so they are in full sun from 11am to around 5pm (hottest time of day). They are virtually silent, require no electricity and will be working hardest when the sun is at its most fierce. The bright white roof and solar powered fans will make the upper floors of this house a happier place to be. 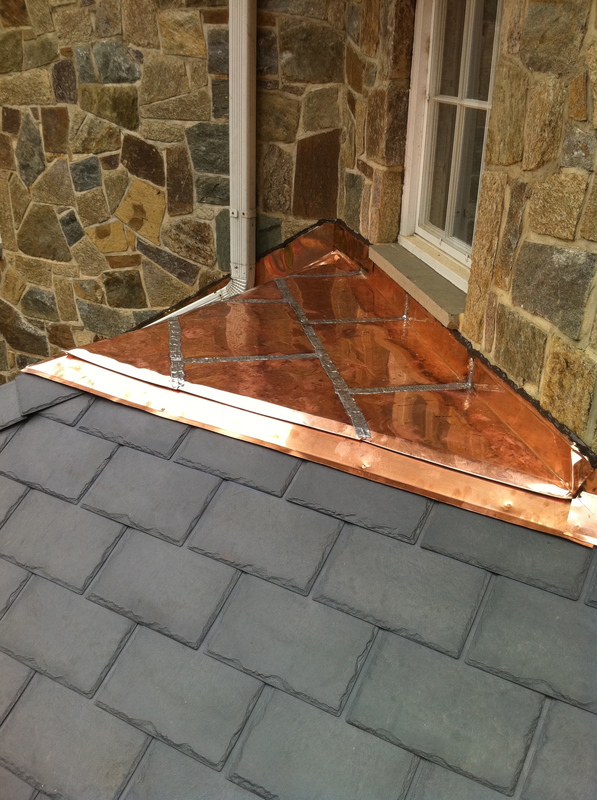 These copper snow guards were placed at 12″ intervals around the entire perimeter of the roof. Snow guards keep sliding snow and ice on the roof until it either melts or breaks up into harmless pieces. This house had no ice protection before and sliding snow and ice had done a lot of damage to the gutters. 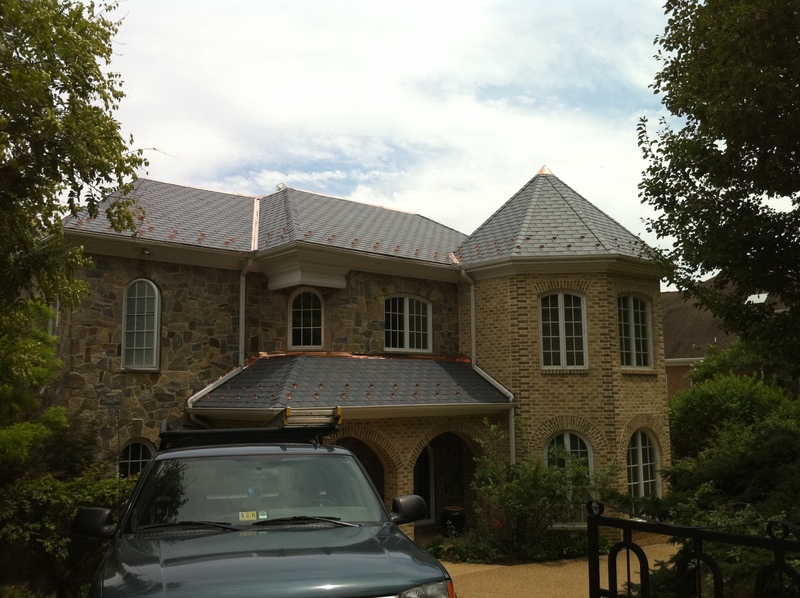 This was a very eco-friendly job; the slates are made from almost 90% recycled materials, the flat roof is energy star rated and there are two solar powered fans keeping the roof cool. This was a tough job; it had very steep slopes with beautiful landscaping beneath, virtually none of the old tiles could hit the ground when the old roof was removed. The week we did this job the temps were in the high 90’s; covering trees and shrubs with tarps on days that hot will have them overheated and cooked by days end. We removed just a few of the old cement tiles at a time, delivered them up to the flat roof where they were taken down the front to the dump truck; basically handling the material four times instead of the normal two. 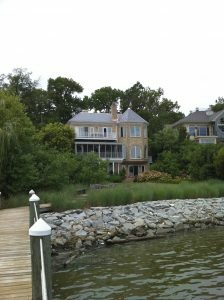 I must say I’m very proud of the roof and also that all of the trees, shrubs and plants are safe and sound. 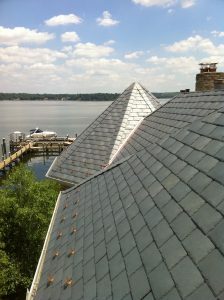 I’ve been installing Eco-Star slate for the past twelve years, my oldest job looks just as good as the day i put it on. If you have a failing real or synthetic slate roof this product might be perfect for you. Call (703) 457-6560 and ask for Tom if you would like to discuss the possibilities.